Why Study A Foundation Course in The UK? Like thousands of other international students you may be considering choosing a foundation course in the UK, as this is good way to prepare yourself for university. With a foundation course, you’ll be able to build up your subject knowledge and boost your qualifications in order to gain entry into a university. Not only this, but international students will also get the chance to significantly improve their English language skills while they learn the fundamentals of their area of study. If you’re intending to gain the additional English language skills and academic knowledge that is required to gain entry onto a UK university, then a foundation course can be an essential step. These types of courses are excellent for any international students who may not have studied their chosen subjects in enough depth. Courses can be tailored towards students who have left high school having completed a non-British curriculum of study, and now wish to enter into an undergraduate course at a university in the UK. You’ll not only gain the chance to fill in any gaps in academic knowledge that you may have, but a foundation course in the UK will also give you the opportunity to fully immerse yourself into student life, and integrate yourself into a new country and city. A foundation course can be your first step towards obtaining a degree, by linking your existing qualifications to UK university entry requirements. What are the benefits of studying a foundation course? The transition to student life at a university can sometimes come as a shock to many international students, especially because they’ll be studying in a whole new country. Also, If you’re used to small class sizes, then the university lecture theatre may seem quite daunting at first. By choosing a foundation course in the UK, you will experience a much smoother transition from your schooling life to your life at university. 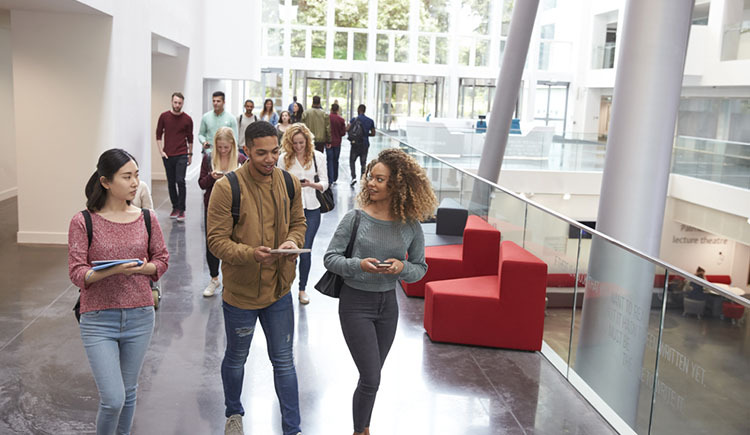 Students are encouraged to explore and debate ideas with each other and with their lecturers at university, because the focus is very much on independent learning. You’ll likely only have a set number of hours during the week for lectures, seminars, and workshops etc. After that you’ll be left to your own study time, where you’ll need to conduct research and carry out assignments to a high standard. This is where a foundation course in the UK can help even more, because it’s designed to encourage and support your independent learning. If you’re hoping to plug up your gaps in academic knowledge, study on a programme tailored to your needs, thrive at university, absorb the culture, and make new friends. Then choosing to study a foundation course in the UK will give you all the tools you need to succeed. What do I need to study a foundation course? A foundation course in the UK is designed to help improve your English language skills to better prepare you for your university degree. However, you will still need to demonstrate a basic level of English before you can begin a foundation course. If you don’t already have any formal English qualifications, then you will need to take an IELTS test and achieve a minimum score of 4.5. Some universities may require a higher test score in order for you to be considered for admission. Other requirements for entry include, a Higher Secondary School Certificate and transcripts, along with a copy of your personal statement, passport and visa. Also you may require a reference from your high school teacher. If you’re an international student who is considering enrolling on one of the many foundation courses in the UK, then please contact us at IEC Abroad. We are ready and waiting to help you find your ideal university.